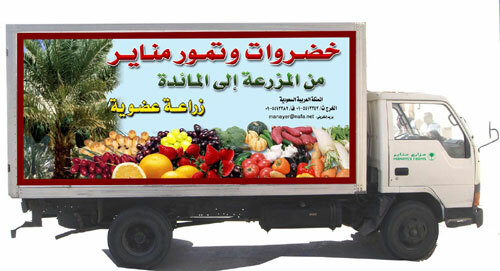 The farm has refer vehicles for distribution of products to sale centre in the city of Riyadh and other cities. Manayer farm uses the latest technologies for sorting, packing and packaging in standard packages for exporting its products outside the kingdom. 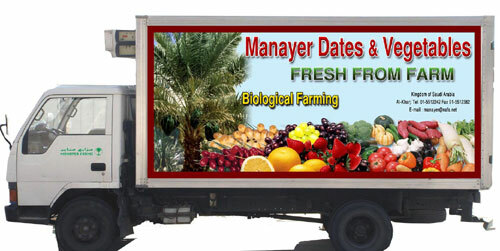 Manayer farm gives due care to the quality of its products to satisfy the outside market. It has exported beans to Holland and green fodder's to GCC states. Dates (compressed, refrigerated fresh dates, dates paste, stuffed dates). There is a transplant production machine with a production capacity of 100,000 plant/per day. This include processing of micro- seeds with high efficiency and complete protection against insects and agricultural diseases. The nursery provides plants ready for in-door and out-door cultivation and it saves about 20% of cost and efforts. Manayer farm has acquired a vast experience in water resources with the aim of providing water of irrigation purposes and increasing productivity by innovative irrigation techniques. The farm is insiders an important agricultural facility for the agricultural faculties and institutions for practical training of their students on the latest techniques in agricultural field. 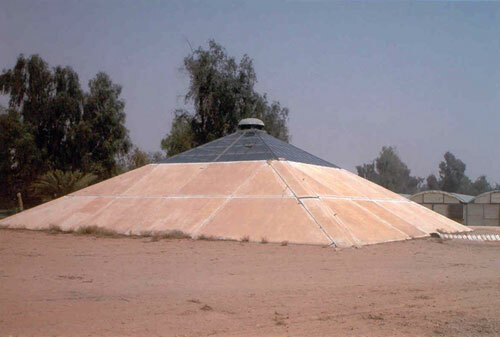 The farm contains, an agricultural pyramid constructed of concrete on a space of 500 square meter with 2,5 m underground depth. This protected facility has no electric power for operating fans or a cooling system. It is mainly used for research and agricultural purposes. 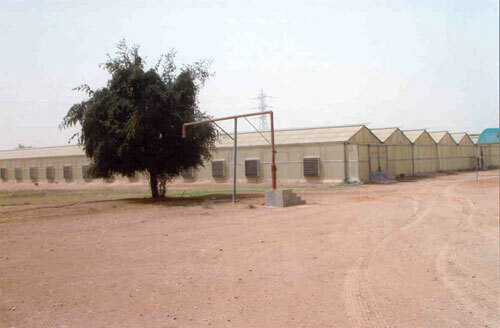 Experiments are made in the farm to develop the cooled and non - cooled green houses whether single or multi - types, in order to confirm with the conditions in the kingdom. There farm conduct trail experiments on the agricultural product types before importing them. Their latest experiment was made on the six - leave cover. Such experiments are made for the sister company - NAFA Agriculture. Dates is considered a strategic and popular crop in the kingdom of Saudi Arabia. Researches for increasing production and minimizing the lost quantities due to some months, insects, and dropping, began at the farm before 15 years. As a result dates bags are manufactured to protect dates and lessening dropping which takes at least 30% of the product. Now, this innovative idea of dates protection bags are widely used all over the world. Protection of palm trees against red beetle coverage of the palm form the bottom up to two meters height. by shade - netting has yielded good result in combating the red beetle. This solution is also considered the most cost - effective way for protecting the palm tree. The farm combated successfully the weeds through usage of shade netting around the trees to shield sunlight from the weeds. This process has minimized the weeds by 90%. 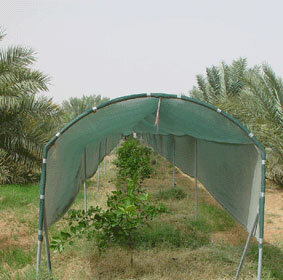 The small fruits plants are effected by the problem caused as a result of low temperatures and frost in the cold areas. To overcome such difficulties the protection - shades as shown in the attached photograph were developed.